Our Engineering Drawing Tests allow you to experience an online examination in the real-time environment. In every online test on Engineering Drawing, you will be presented with Multiple Choice Questions (MCQs) which will test your skills in Engineering Drawing Concepts in a detailed and comprehensive manner. In the test, each question will have 4 options to choose from. You should select only 1 correct option as an answer and then move on to the next question. Once you submit answers to all the questions, you will be given your final test score. In the Online Engineering Drawing Test, for every correct answer, you will be given 2 points. There will also be negative marking of -1 for every wrong answer. So, you will have to be more careful in choosing the answers to the question in your online examination. If needed, you should skip to the next question and come back to the previous question later so that you can do proper time management for the online mock tests. 1. "Engineering Drawing Practice Tests" - In Engineering Drawing practice tests, there will be a series of practice tests wherein you can test your Engineering Drawing concepts on every chapter separately. There will not be any time limit on these tests. 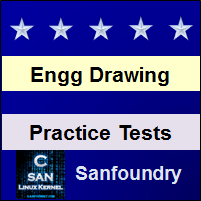 So, Engineering Drawing Practice Tests should be the first set of tests which you should attempt. Goto these practice tests here. 2. "Engineering Drawing Mock Tests" - In Engineering Drawing mock tests, there will be a series of mock tests wherein you can test your Engineering Drawing concepts on every chapter separately, but there will be a fixed time limit per test. So, it is similar to Engineering Drawing Practice Tests, but with an added constraint of time limits. You should try Engineering Drawing Mock Tests if you are appearing for any online examination soon. Goto these mock tests here. 3. 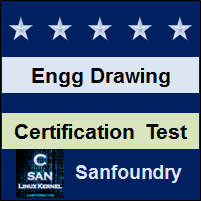 "Engineering Drawing Certification Test" - Once you are through with your Engineering Drawing concepts, then you should try our Engineering Drawing Certification Test wherein Sanfoundry will issue a free Certificate to you if you scored either Grade A* or Grade A in Engineering Drawing Certification Test. Goto Engineering Drawing Certification test here. 4. "Engineering Drawing Internship Test" - If you are interested to do Internships in Engineering Drawing at Sanfoundry, then you must take our Engineering Drawing Internship Test. If you scored either Grade A* or Grade A in Engineering Drawing Internship Test, then you are eligible for Internship at Sanfoundry in Engineering Drawing. Goto Engineering Drawing Internship test here. 5. 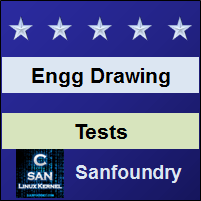 "Engineering Drawing Job Test" - If you are a fresher, a dropout, an experienced person and if you know Engineering Drawing well and looking out for jobs in Engineering Drawing domain at Sanfoundry (or our Network of Companies), then you should try and qualify our "Engineering Drawing Job Test". 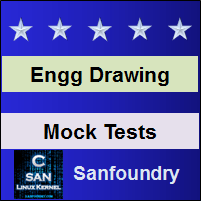 If you scored either Grade A* or Grade A in Engineering Drawing Job Test, then you are eligible for a Job at Sanfoundry (or our Network) in Engineering Drawing domain. Goto Engineering Drawing Job test here. For every "Engineering Drawing Practice Test", Total Questions: 20, Total Time: Unlimited. For every "Engineering Drawing Mock Test", Total Questions: 20, Total Time: 20 Minutes. For "Engineering Drawing Certification Test", Total Questions: 50, Total Time: 1 hour. For "Engineering Drawing Internship Test", Total Questions: 50, Total Time: 1 hour. For "Engineering Drawing Job Test", Total Questions: 50, Total Time: 1 hour. Before you get started on these series of online tests on Engineering Drawing, you should learn, study and practice our collection of 1000 MCQs (Multiple Choice Questions and Answers) on Engineering Drawing here. We also prefer that you should practice Engineering Drawing practice tests and mock tests completely before attempting the certification test. Here is the list of online practice tests and mock tests on Engineering Drawing. Each online test focuses on a "Specific chapter of Engineering Drawing". So, you should try both practice test and mock test on every chapter to do a self-assessment of your knowledge (along with time-limit constraints) in every area or sub-topic of Engineering Drawing. Engineering Drawing Certification test, Internship test, and Job Test are mentioned at the end of this list. 1. Engineering Drawing Test 1 – This set of online test on “Engineering Drawing” tests your skills on Drawing Tools and their Uses – 1, Drawing Tools and their Uses – 2, Sheet layout, Types of Machine Drawing and Free-Hand Sketching, Different Types of Lines – 1, Different Types of Lines – 2, System of Dimensioning – 1, System of Dimensioning – 2, Types of Dimensioning – 1, Types of Dimensioning – 2, Basic Principles in Dimensioning -1, Basic Principles in Dimensioning – 2. 2. Engineering Drawing Test 2 – This set of online test on “Engineering Drawing” tests your skills on Terminology of Dimensioning – 1, Terminology of Dimensioning – 2, Representative Factor – 1, Representative Factor – 2, Types of Scales – 1, Types of Scales – 2, Types of Scales – 3, Plane Scales – 1, Plane Scales – 2, Diagonal Scales – 1, Diagonal Scales – 2, Construction of Parallel & Perpendicular Lines – 1. 3. Engineering Drawing Test 3 – This set of online test on “Engineering Drawing” tests your skills on Construction of Parallel & Perpendicular Lines – 2, Drawing Regular Polygons & Simple Curves – 1, Drawing Regular Polygons & Simple Curves – 2, Drawing Tangents and Normals for Different Conditions of Circle – 1, Drawing Tangents and Normals for Different Conditions of Circle – 2, Construction of Ellipse – 1, Construction of Ellipse – 2, Construction of Parabola, Construction of Hyperbola, Construction of Cycloidal Curves, Construction of Involute, Construction of Spiral. 4. Engineering Drawing Test 4 – This set of online test on “Engineering Drawing” tests your skills on Basics of Conic Sections – 1, Basics of Conic Sections – 2, Basics of Conic Sections – 3, Construction of Evolutes and Helix, Construction of Helical Springs, Construction of Screw Threads, Helix upon a Cone, Cam, Loci of Points by Different Methods, Basics of Orthographic Projections. 5. Engineering Drawing Test 5 – This set of online test on “Engineering Drawing” tests your skills on Planes of Projections and Four Quadrants, First Angle Projection Method, Third Angle Projection Method, BIS Code of Practice, Problems on Orthographic Projection, Projection of Points in First Quadrant, Projection of Points in Second Quadrant, Projection of Points in Third Quadrant, Projection of Points in Fourth Quadrant. 6. Engineering Drawing Test 6 – This set of online test on “Engineering Drawing” tests your skills on Projection of Straight Lines Parallel to Plane, Projection of Line Contained by Plane, Projection of Line Perpendicular to one of the Plane, Projection of Line Inclined to one Plane and Parallel to other, Projection of Line Inclined to both the Planes, Line contained by a Plane Perpendicular to Both the Reference Planes, True Length of a Straight Line and its Inclinations with the Reference Planes, Traces of a Line, Basics of Planes. 7. Engineering Drawing Test 7 – This set of online test on “Engineering Drawing” tests your skills on Projection of Planes Parallel to one of the Reference Plane, Projection of Planes Inclined to one of the Reference Plane & Perpendicular to other, Projection of Oblique Plane, Basics of Solids, Projection of Solids in Simple Position, Projections of Solids with Axis Inclined to Vertical Plane and Parallel to Horizontal Plane, Projection of Solids with Axis Inclined to Horizontal Plane and Parallel to Vertical Plane, Projection of Solids with Axes Inclined to both Horizontal and Vertical Plane, Projection of Spheres. 8. Engineering Drawing Test 8 – This set of online test on “Engineering Drawing” tests your skills on Basics of Section of Solids, Sections of Prisms, Sections of Pyramids, Sections of Cylinders, Sections of Cones, Sections of Spheres, Development of Surfaces, Intersection of Surfaces, Isometric Axes, Lines and Planes. 9. Engineering Drawing Test 9 – This set of online test on “Engineering Drawing” tests your skills on Isometric Drawings, Isometric Drawing of Planes or Plane Figures, Isometric Drawing of Prisms and Pyramids, Isometric Drawing of Cylinders, Isometric Drawing of Cones, Isometric Drawing of Spheres, Oblique Projections, Definitions and Methods of Perspective Projections, Types of Perspective, Perspectives of Circles and Solids. 10. Engineering Drawing Test 10 – This set of online test on “Engineering Drawing” tests your skills on Orthographic Reading and Conversion of Views, Centres of Gravity, Moments of Inertia of Areas, Screw Threads, Nut and Washers, Locking Arrangements for Nuts, Bolts, Riveted Joints, Welded Joints, Computer Aided Drawing. 11. Engineering Drawing Certification Test - This set of online free certification test on "Engineering Drawing" tests your skills on all areas (all chapters, topics and subtopics) of Engineering Drawing. 12. 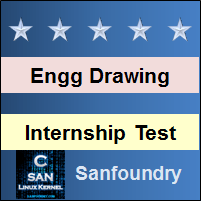 Engineering Drawing Internship Test - If you scored either Grade A* or Grade A in our Engineering Drawing Internship Test, then you can apply for Internship at Sanfoundry in Engineering Drawing. 13. 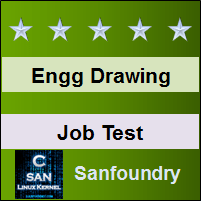 Engineering Drawing Job Test - If you scored either Grade A* or Grade A in our Engineering Drawing Job Test, then you can apply for Jobs at Sanfoundry in Engineering Drawing domain. Best Wishes for your Engineering Drawing Tests!